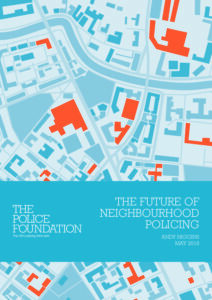 The Police Foundation’s future of neighbourhood policing project set out to bridge the gap between the end of the Neighbourhood Policing Programme in 2008 and 2025, when the Policing Vision’s proactive preventative form of local policing is realised. This study presents an investigation of how and why neighbourhood policing has changed in England and Wales since 2008, and what it looks like in 2017/18. It concludes by presenting a set of principles for delivering sustainable, preventative, integrated and publicly connected local policing services for the future.